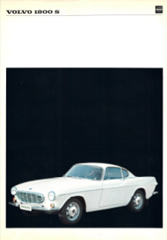 I collect brochures, data sheets, and other paraphernalia for the Volvo 1800S, a car I used to own in England and that one day I'm going to own again. Occasionally, I'll post here some images of my collection (see here for an older post showing off a 4 page brochure). Unfortunately the original preparation and printing weren't very good: the picture is obviously cut from another photo (taken in bright sunlight) to put it against the black background, and at magnification it shows. Some of the data on the back had been changed (the fonts are slightly different) before printing. With these data sheets, it's fun to read the technical data to see what they thought was important to mention in those days. Engine displacement in cu.in. (109 cu.in. is the same as 1800 cc, hence the name of the car). There's no mention of fuel economy or of top speed or of acceleration (the latter two these days are de rigueur pieces of info for sports cars). And I'm so glad that the three-point safety belts are standard equipment. Nice car. I used to have a 122s. It was never in very good condition, but I'd trade in my minivan for one in a second (if my wife would let me). Paul: The shop where I had my 1800S serviced back in the day were always trying to sell me some kind of 122S, not to replace, but to "augment". ("Same engine, guv, you'll be right at 'ome.") Still like looking at Amazons, even now.